Efficiently moving goods to their destination is an important aspect of international trade. If you can develop a robust and comprehensive logistical process within your business the practical upshot will be higher profits and lower costs. Logistics encompasses a number of distinct components that include the legislation that you must adhere to when moving goods to other EU countries and beyond, plus the type of transport that is most appropriate for your business's goods. Trade is now on a global scale. But with well developed transport systems, your business can easily move its goods to any country in the world. The vast majority of goods are moved via sea. This is the most cost effective type of transport, but it is the slowest. If you need to transport large amounts of goods for warehousing before transshipping to their final destination, sea transport is ideal. It's a good idea to use the services of a freight forwarder as they will have vast experience of this type of transport. 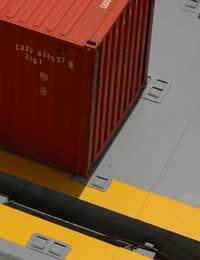 Most goods that are moved for international trade will use containers. These are ideal for sea transport, but containers are also routinely used by rail transporters as well. Think about your goods distribution. If your customer is near a rail freight terminal, rail is a good transportation option to choose. This type of transport is certainly the fastest but it is also the most expensive. If your goods are perishable, or you need to move your consignments quickly to their destination, airfreight is the ideal transport method. Charter and scheduled flights are available at varying costs. Look at these closely to ensure your costs stay within your budget. Specialist couriers also use airfreight, but remember that each consignment can't usually exceed 32 kilos. If your business will be transporting dangerous goods you have special legislation that must be adhered to at all times. You can read more about moving dangerous goods on the Health and Safety Executive website: www.hse.gov.uk/cdg/index.htm. You must also under law appoint a Dangerous Goods Safety Adviser. Also remember that your normal C88 (your SAD or Single Administrative Document) form must be replaced with the DGN (Dangerous Goods Note) to comply with transport regulations. The supply chain that your logistical processes are a part of are operated internationally by an electronic system called the New Computerised Transit System (NCTS). This system is closely linked to Community Transit in that NCTS is used to generate Community Transit documents that are used for customs procedures. It is vitally important that all of your consignments travel with a full set of documentation and that this is logged on NCTS. Your freight forwarder can be invaluable with these systems to help you avoid mistakes and delays. It is important that every consignment has the appropriate insurance to protect your business against accidental loss. Cargo insurance is available in three levels: A, B and C. A provides the most comprehensive cover, with C the least. The terms of sale and the kind of goods, plus the type of transport you are using will all impact on the type and cost of insurance you can buy for your consignments. Again your freight forwarder can be a great help as they can often consolidate consignments to reduce shipping and insurance costs. If your business needs to transport relatively small numbers of goods internationally, the postal system can be used. Courier services offer a global door-to-door service. Remember that there are weight restrictions that apply. Postal imports and exports can be cost effective as they use the courier's own scheduled flight that enable you to have clearly defined costs. If your consignment exceed £2,000 you will have to complete the standard SAD form that all international traders use. Insurance should also be attached to your postal imports or exports. Duty also has to be taken into consideration. If you will only be transporting a few items you can apply to become what Customs call an 'occasional importer'. You do this by completing form C&E 1165. Further details are available on the HMRC website. Does the country you are transporting to or from have a good transport infrastructure? Do you need to use more than one mode of transport? How fast do you need to move your consignments? Do your consignments require any special packing requirements (refrigeration or for hazardous goods)? Does your customer have any specific terms of sale you must comply with?